Value-based purchasing (VBP) is a methodology of healthcare payment reform that focuses on paying providers for quality and value, not just volume. Sometimes referred to as “pay-for-performance” (P4P), value-based purchasing is becoming the new normal in healthcare, linking provider reimbursements to quality measures and cost-efficiency. In January 2015, the Department of Health and Human Services (HHS) announced its intention to link 90% of all traditional Medicare payments to quality by the end of 2018, and value-based purchasing is the methodology being used to achieve this goal. The Centers for Medicare and Medicaid Services (CMS) is leading the way in this new era of quality and cost accountability, and commercial and private payers are following CMS’s lead. Value-based purchasing is already gaining strong momentum, and it will certainly influence the future of healthcare payment reform, so it’s helpful to have a brief history and basic understanding of this significant methodology. The value-based purchasing journey began in 2008, with the passing of the Medicare Improvements for Patients & Providers Act (MIPPA), which prepared the way for the implementation of the End-Stage Renal Disease Quality Incentive Program (ESRD-QIP) in 2012. The first of its kind in Medicare, this value-based program changed the way CMS paid for the treatment of patients with ESRD, linking a portion of outpatient dialysis facilities’ payments directly to their performance on certain quality care measures. This new pay-for-performance approach scored facilities on each measure and dinged them with a payment reduction of up to two percent if their total performance score did not meet or exceed established performance standards. Payment and quality performance were now being aligned as CMS focused on its Quality Strategy to improve health care and to reduce costs. Along with the ESRD-QIP, a number of other value-based legislation, programs, and activities would follow to support CMS’s vision of improving health delivery by “using incentives to improve care; tying payment to value through new payment models; and changing how care is given through better teamwork, better coordination across healthcare settings, more attention to population health, and putting the power of healthcare information at work” (CMS). The first of its kind in Medicare, this value-based program changed the way CMS paid for the treatment of patients with ESRD, linking a portion of outpatient dialysis facilities’ payments directly to their performance on certain quality care measures. 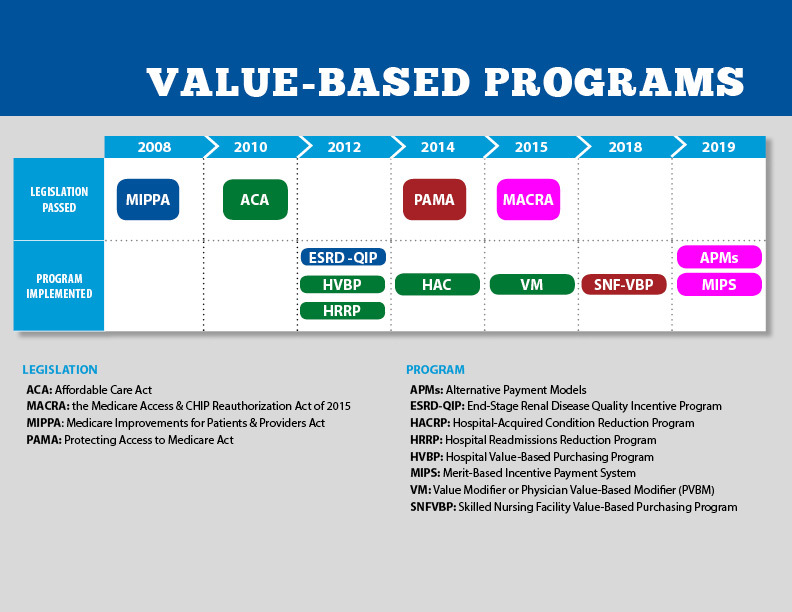 In 2010 the Affordable Care Act paved the way for a number of value-based purchasing programs, including the Hospital Value-Based Purchasing Program (HVBP or Hospital VBP). The HVBP rewards participating hospitals for achieving performance thresholds for improved patient experience and care coordination, patient safety, clinical care, and efficiency and cost reduction. Hospitals may earn a 2 percent positive Medicare reimbursement adjustment for inpatient services under the Inpatient Prospective Payment System (IPPS). The IPPS is a system of payment for the operating costs for acute care hospital inpatient stays under Medicare Part A (hospital insurance), based on prospectively set rates. In addition, under the IPPS, each case is categorized into a diagnosis-related group (DRG), which has a payment weight assigned to it, based on the average resources used to treat Medicare patients in the DRG. The value-based purchasing methodology continued to gain momentum in 2014 with the Protecting Access to Medicare Act (PAMA), which established the Skilled Nursing Facility Value-Based Purchasing Program (SNF-VBP). Like other VBP programs, the SNF-VBP uses value-based incentive payments to reward providers for the quality of care they give to patients. Most significantly, in April 2015, the Medicare Access and Chip Reauthorization Act (MACRA) established the Quality Payment Program (QPP), which introduced the Merit-based Incentive Payment System (MIPS) and the Alternative Payment Model (APM) reimbursement structures. These new value-based payment structures were designed to measure and pay eligible clinicians (ECs) based on Quality, Resource Use, Clinical Practice Improvement, and Promoting Interoperability (formerly known as Meaningful Use of EHR Technology, and most recently known as Advancing Care Information). The Quality Payment Program initiated a number of innovative, alternative payment models such as the Pioneer ACO Program, the Medicare Shared Savings Program (MSSP), the Bundled Payment for Care Improvement Initiative, and the Comprehensive Primary Care Initiative, among others, and all models were strategically designed to incentivize care providers with shared savings, bonuses, and other financial rewards to venture into greater shared risk, while focusing on quality and efficiency. For more details on these value-based reimbursement models and the framework that HHS has adopted to categorize payment according to how providers are reimbursed to provide care, see TXCIN’s May 1st, 2018 article, “The Five Templates for Value-Based Reimbursement” (http://www.insight-txcin.org/post/the-five-conceptual-templates-for-value-based-reimbursement) and CMS’s January 26th, 2015 press release, “Better Care. Smarter Spending. Healthier People: Paying Providers for Value, Not Volume” (https://www.cms.gov/Newsroom/MediaReleaseDatabase/Fact-sheets/2015-Fact-sheets-items/2015-01-26-3.html). This is the essence of the value-based purchasing methodology, and it is essentially changing the healthcare landscape, morphing the traditional fee-for-service model into a complex array of alternative, hybrid, pay-for-performance models where FFS reimbursements are contingent upon achieving quality measures and reducing costs. Chee, Tingyin T., MD, MPA, et al. “Current State of Value-Based Purchasing Programs.” HHS Public Access. May 31, 2016. “CMS Drives Patient-Centered Care over Paperwork in Proposals to Modernize Medicare and Reduce Burden.” CMS.gov. Press Release. April 27, 2018. CMS.gov. https://www.cms.gov/Medicare/Quality-Initiatives-Patient-Assessment-Instruments/Value-Based-Programs/Value-Based-Programs.html. Accessed May 1, 2018. CMS.gov. Press Release. January 26, 2015.